Jennifer Gardner woke at 6:45 and girded herself for the grueling day ahead. She’d intended to get up earlier, but chemotherapy and a phalanx of other pharmaceuticals had again zapped her strength. She asked me to wheel her to the shower but her 25-year-old son Griffin, her de facto health care advocate, held firm. They had to get the eight o’clock boat to make the first of her four appointments at Mass General and they were already cutting it close, given the crapshoot of Boston traffic. If they were late for their first appointment, the domino effect would make a long day much longer, and could even jeopardize getting home that night. As they began the long process of getting her dressed, Jennifer, 54, wondered aloud how she raised such a heartless son. Griffin laughed. They often traded playful japes to lighten the grind on travel days. If all went well, they would get home around 8:30 that night — after five hours of driving (minimum), two hours on a boat (assuming it’s running), and five hours at Mass General (if they’re on time), where Jennifer gets experimental treatment for a glioblastoma, an aggressive, inoperable brain tumor — the same malady that struck Senator John McCain. The glioblastoma also sparked a stroke that paralyzed Jennifer’s right side and left her speech and cognition muddied. It was an especially cruel twist, given that she’d been skiing expert slopes in Vail, Colo., only three months earlier. The weekly trek to Boston was taking a toll on everyone — mentally, physically and financially. Jennifer, Griffin, and sometimes her mother and daughter (both named Leila) were spending endless hours sitting in traffic, often wondering if they would make her appointments, or if they’d make the boat home. When they eventually returned to their West Tisbury home, Jennifer barely had the energy to crawl into the hospital bed that sits where her dining table once was. It would take her most of the next day to recover. Then, like a gift from above, Griffin heard about Angel Flight Northeast. Since 1996, the volunteer pilots from Angel Flight NE have been flying patients and their caregivers from locations in New England, New York, New Jersey and Pennsylvania, to the hospitals and clinics where they receive treatment. The pilots of Angel Flight NE donate their time and cover the costs — fuel, maintenance, inspections — out of their own pockets. Since its inception, a roster of more than 1,000 Angel Flight NE pilots have flown more than 14 million miles and provided more than 77,000 patients and their families free flights. Angel Flight NE pilots have flown more than 12,000 missions to and from Martha’s Vineyard, helping more than 200 Islanders get the treatment they need while sparing them the stress, the expense, and the uncertainty of travel to America. 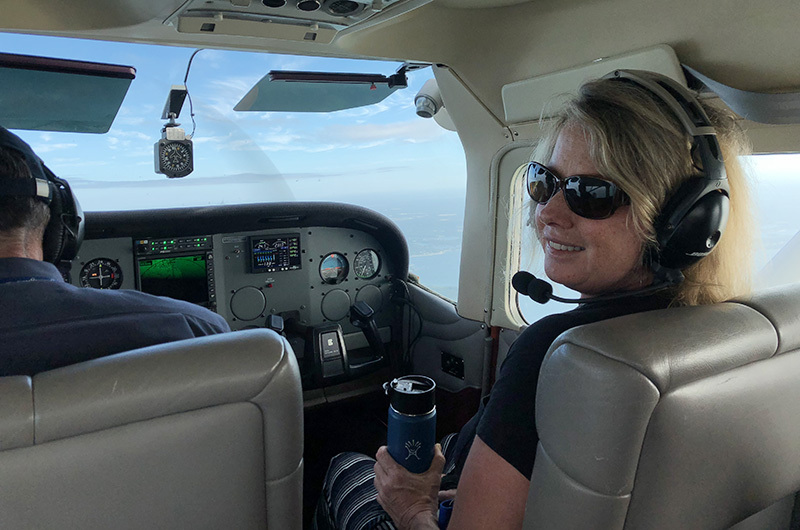 Over the first three months, Angel Flight NE saved Jennifer a minimum of 67 valuable hours of sitting in a boat or a car while also sparing her and Griffin the ever-lurking anxiety of the Island factor. “Your chariot awaits,” Angel Flight NE pilot Gary Ferguson said to us as he entered the general terminal at Martha’s Vineyard Airport, shortly before noon on a cloudy autumn day. Jennifer beamed, her glacier blue eyes sparkled. Today she was well rested. She’d even had time to take a shower. She reached up from her wheelchair with her left arm and hugged Gary. Gary had flown in from Chatham, where he’s lived since retiring from his orthopedic surgery practice at Brown University Hospital, a year-and-a-half ago. He has the gentle bearing of a country doctor with nary a wrinkle in his plaid shirt and khaki slacks. Gary is one of several Angel Flight pilots who’s flown Jennifer to Mass General for treatment. Over his one and a half years with Angel Flight, he has flown patients from Vermont, Maine and Nantucket. Since he’s based on the Cape, many of his flights originate on the Vineyard. Gary wheeled Jennifer onto the tarmac where his impeccably maintained 1981 Cessna Skylane awaited. Cessnas are built with the wing atop the fuselage, a feature that Gary factored in when he purchased the airplane because it makes it easier to board wheelchair-bound patients. It’s still a challenge, and after a wobbly pas de deux between mother and son, Griffin gently bear hugged his mother into the co-pilot seat. After rapid-fire exchanges with the control tower in the aeronautical argot of numbers, letters and random words, Gary was cleared for takeoff. Soon, the state forest, Goodale’s Pit and the estates of Katama faded in the distance. Once over Vineyard Sound, Angel Flight 1232 ascended into dense cloud cover and zero visibility. Gary was unfazed by the sudden turbulence, operating the myriad cockpit controls with surgical calm and precision. At 5,000 feet, Angel Flight 1232 broke into clear skies, carpeted below by puffy clouds that radiated an ethereal glow. Somewhat appropriately, it looked like a Hollywood version of heaven, where any moment winged cherubs might zip by. Jennifer took a deep breath and took in the view. “It’s so peaceful up here,” she said. Halfway into the 50-minute trip, a break in the clouds showed miles of gridlock on Route 93. I tapped Jennifer’s shoulder and pointed down to the mayhem that Angel Flight had spared us. Jennifer again thanked Gary for the ride. Jennifer smiled, shaking her head like she couldn’t believe her good fortune. Angel Flight 1232 touched down smoothly at Signature Aviation, a terminal at Logan Airport that caters mostly to private jets. Signature Aviation supports Angel Flight by waiving the $240 landing fee. Once Jennifer was safely seated in her wheelchair, Gary bent over and looked in her eyes. “I believe in you, Jennifer,” he said. “You’re my hero,” she said, reaching up for another hug. To donate to Angel Flight NE, go to angelflightne.org. To request an Angel Flight, contact Michele Varney, Mission Coordinator, at angelflight@angelflightne.org or by phone at 978-794-6868. To become an Angel Flight NE Volunteer Pilot, contact Roger D’Entremont, Pilot Resource Management Coordinator, pilots@angelflightne.org or by phone at 978-794-6868. Beautiful story. Another Angel I’d like to suggest to Ms Gardner..please look into something called, among other things, Rick Simpson Oil. Thank you to Barry for capturing the essence of our mission and the devotion of our volunteer pilots. We are honored to be able to assist patients like Jennifer to access life-saving medical care. For every one patient we assist, there is 4 more that can benefit from our services. Help us spread the word so distance is never an obstacle for medical care and treatment. Nice story. The dedicated pilots of angel flight do a great job. "Imitation is the sincerest form of flattery" = There is a similar group called Patient Airlift services http://www.palservices.org/ Additionally, if you find yourself in need of treatment at a hospital outside the range of these aircraft, there is another group "Corporate angel network' http://www.corpangelnetwork.org/#/home that makes seats available on corporate jets. All of these generous resources are appreciated by those in need.